After Neil Armstrong and Buzz Aldrin had landed their LM Eagle on the Moon and while they were preparing for their foray onto the surface, Mike Collins made strenuous efforts to locate the tiny LM among the monotonous wastes of craters on Mare Tranquillitatis by aiming his sextant where mission control reckoned they were. Getting the optics around to face the surface and back again involved carrying out a number of manoeuvres. It was during the manoeuvres after one such viewing opportunity that Collins got a call from Capcom Owen Garriott. What was rankling him was a weight-saving measure that had the downside of substantially complicating some of the operational aspects of flying a mission because it limited the range of attitudes that the spacecraft could adopt. Because of this, the crew and flight controllers had to avoid orienting the spacecraft in certain directions with respect to the guidance platform. This characteristic was inherent in the system as designed by the MIT team who had settled on a three-gimbal mounting for the platform, similar to the system they had designed for the Polaris missile, and unlike the four gimbals found in the Saturn V instrument unit and the Gemini spacecraft. Collins was a veteran of Gemini, and knew the advantage given by the fourth gimbal. But there were good, solid reasons for implementing only three gimbals. As well as saving the weight of a heavy outer gimbal, trade-offs included a reduced tendency for the platform to drift in its orientation, and greater accuracy. However, the three-gimbal arrangement had this unfortunate side effect whereby, if the gimbals were moved in a particular fashion, the assembly lost its ability to maintain the platform's alignment - a condition termed gimbal lock, and one that meant that the system had lost all knowledge of the direction in which the spacecraft was pointing. Having a fourth gimbal avoided this problem. As a result, care had to be taken during the flight-planning process, and throughout the flight itself, to avoid risking gimbal lock. If gimbal lock did occur, it was a time-consuming procedure to fully realign the platform, possibly with the loss of important operational work. Even worse, if it occurred near a time critical manoeuvre where good platform alignment was important, there would be no time available to correct it. To help crews to steer clear of it, two areas on the 8-ball's surface were marked in red. Manoeuvring the spacecraft to bring them towards the centre of the display meant risking gimbal lock. 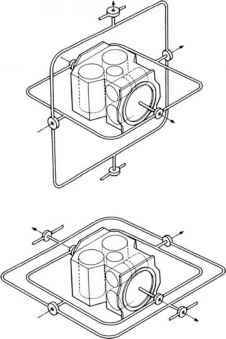 A schematic of how a guidance platform can go into gimbal lock. adopted that allowed the axes of the outer and inner gimbals to line up. When this condition was approached, the gimbal system lost its ability to isolate the platform from the spacecraft's rotations because there were now only two degrees of freedom. All the gimbal axes were now on a single plane, so any rotation of the spacecraft around an axis outside that plane could not be accommodated by any of the gimbal axes. Since the region that flirted with gimbal lock was defined by the current REFSMMAT, whenever the spacecraft needed to manoeuvre to an attitude that might approach gimbal lock, mission control had to give the crew a new REFSMMAT according to which the platform could be realigned. Of course, all this was worked out during mission planning. As many as eight REFSMMATs might be used during a mission, switching as the operational requirements changed. Each time the REFSMMAT changed, the platform would be duly realigned. But avoiding gimbal lock was only one reason for changing the REFSMMAT. A more important reason was to aid the monitoring of critical events, such as launch, reentry, and the major manoeuvres that required long engine burns or where the correct attitude of the spacecraft was paramount. By aligning the guidance platform to an appropriate REFSMMAT that matched the required attitude for the manoeuvre, the crew would find that when the spacecraft was pointing in the right direction, the 8-ball display would be easy to interpret. Any attitude errors, which must be avoided during an engine burn, could therefore be easily spotted and corrected. 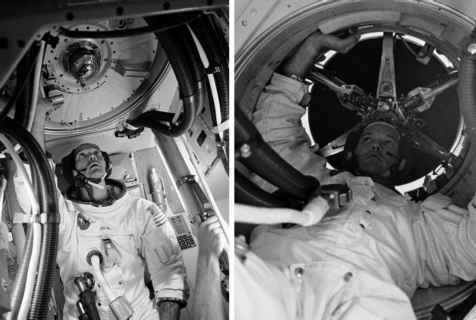 When Apollo 8 made the first manned flight to the Moon, only three REFSMMATs were required. The purpose of the mission was simple - get to the Moon, orbit it ten times, and get back. There was little reason for the spacecraft to adopt widely varying attitudes. For the journey to the Moon, the platform was aligned to the launch pad REFSMMAT. This represented the launch pad's attitude in space at the moment of launch, as determined with respect to the stars. This orientation made it easy for the crew to monitor the progress of their ascent from Earth's surface. Later, as they approached the Moon, they realigned their platform to a new REFSMMAT, one that coincided with their ideal attitude for the engine burns that took them into lunar orbit. Choosing such an orientation for their platform made it much easier for them to monitor their attitude on the spacecraft's displays. Once they had left the Moon, Lovell realigned Apollo 8's platform to a suitable REFSMMAT for re-entry into Earth's atmosphere, again to make it easier to monitor this critical event. For the advanced J-missions, Apollos 15 to 17, much more sophisticated use was made of the Apollo hardware and a total of eight REFSMMATs were defined for the guidance system. The start of the journey began with the platform aligned with the launch pad, as with Apollo 8. Coasting to the Moon required the spacecraft to be turned slowly to distribute heat around its surface. As this rotation had to avoid the gimbal lock range, a special REFSMMAT was generated to suit. Each of the three major manoeuvres by the CSM at the Moon had its own REFSMMAT to simplify crew monitoring. Two additional REFSMMATs were defined to aid the lunar landing and lift-off, each representing the orientation of the landing site at the times of these events. Finally, as with Apollo 8, a REFSMMAT was defined for re-entry.